Hi there! Today I made a Pinterest inspired treat! I have seen so many yummy looking Carrots out there for Easter I just had to make one myself! My carrot is made of all orange Reese's Pieces! I filled a Cone Bag from Jaded Blossom and added a cute little tag! The leaf of my carrot is made from my favorite lime green tulle! 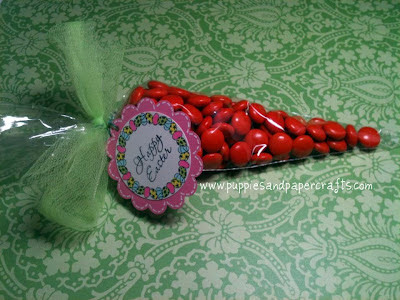 The stamps on the tag are from Jaded Blossom's Easter Treats set! These yummy carrots can be filled with Cheez-its, Cheetos, Goldfish, anything orange! What Pinterest crafts have you made lately? Make sure and stop by tomorrow for another project! Beautiful :) I love the Easter tag. So cute Love your tag. YUM YUM Love the coloring of the eggs ! !